Sebastien Loeb, the most successful rally driver in a history, who has nine world championship titles and 78 WRC wins on his account, will return to the FIA World Rally Championship in 2018. Citroën Racing confirmed today that Loeb will participate in three rounds – Rally Mexico (March 8-11), Tour de Corse – Rallye de France (April 5-8) and RallyRACC Catalunya – Costa Daurada (October 25-28). Sebastien Loeb will drive a Citroën C3 WRC alongside his regular navigator Daniel Elena. 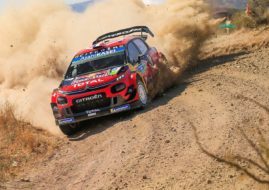 Loeb will join Citroen factory team in three events as a replacement for Craig Breen, who will participate in remaining ten rounds. Kris Meeke will be in another car in all thirteen rallies. “The feeling you get in rally is one of the most thrilling feelings I’ve ever experienced, and I was excited about driving one of these new WRCs in a race. It’s nice to be able to do it in the team with which I’ve enjoyed so much success,” Sebastien Loeb commented. Loeb retired from full-time WRC career at the end of 2012. After that, he participated in four rounds in 2013, winning at Monte-Carlo and Argentina. His last WRC appearance was at 2015 Rallye Monte-Carlo when he finished 8th in a Citroen DS3 WRC. In the meantime, Loeb participated two seasons in the WTCC and after that joined Peugeot in the FIA World Rallycross Championship. He also participated two times at Dakar Rally. In January 2018, he will start at Dakar Rally for the third time before returning to WRC. “Everyone was pleased after the test sessions done this year, myself first and foremost, and these three appearances were the logical next step. I don’t have any expectations, I just want to enjoy myself. I thought it made sense to take part in the French round, especially since I’ve always loved racing on Tarmac, although I’m not familiar with the current route of the Tour de Corse. Spain seemed like a good option too. And although I’m expecting it to be pretty tough given the time that has passed since I last competed there, I also wanted to contest a gravel rally. 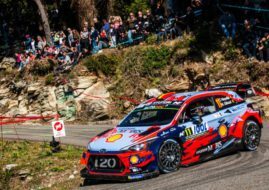 We opted for Mexico, since I have good memories of racing there and the route hasn’t changed too much since I was last involved in the championship,” added Loeb. “I’m delighted to see there will be another chapter in the great history between between Sébastien Loeb and Citroën. He couldn’t return to the WRC with anyone other than us! Seb confirmed he has lost none of his speed and skill during the test sessions, although he is bound to be short of knowledge of the stages and time in the car compared with the increasingly tough competition,” Citroën Racing director Yves Matton said.